When I was in college and in the years that followed one of my favorite musicians was Andrae Crouch. I remember going into Cedar Lodge Chapel with Colleen Dodge and Susie McDowell when I worked at Warm Beach Camp and Susie and I would belt out Andrae Crouch songs with Colleen at the piano. His music was powerful, full of truth and sung from his heart. Here's Andrae Crouch in 1975, sharing his testimony and singing one of his most popular songs, Through it All. at a Billy Graham Crusade in New Mexico. It was clear from Andrae Crouch's music that he as looking forward to eternity with Jesus. Back in 1972 ehe and his group, the Disciples, recorded It Won't Be Long. He passed into the presence of the Lord on January 8, 2015. If you'd like to know more about the live and ministry of Andrae Crouch and his twin sister Sandra, here is an interview that he did with CBN Music. "Fear Not, Nor Be Afraid"
I've heard it said that thes admonition, "Fear not!" (or some iteration of it) appears 365 times in the Bible. I've even said it here on this blog. But I never did the work of verifying this statement by looking them all up and counting them. Instead I searched online for a simple list with all 365 references listed for me so that I could ponder a fresh one every day. And in my search I came across Melinda Martin, whose Etsy Store is called Minister's Wife. She actually did the research, and you know what she found out? There aren't really 365 "Fear Not!" statements in the Bible! 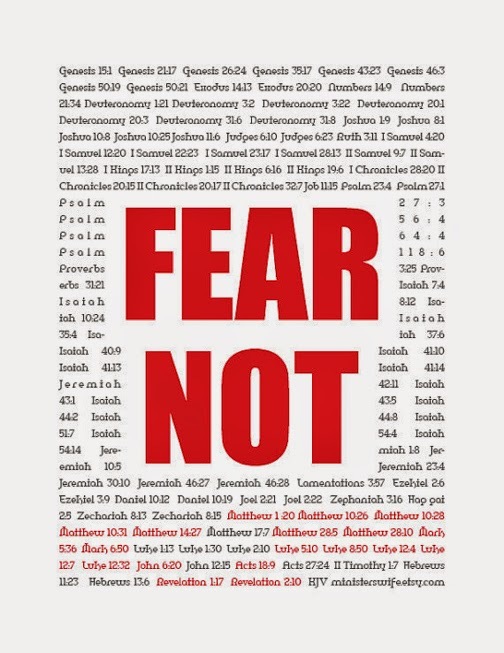 In fact, there are just over 80 occurrences of "Fear not" in the King James Version, and another 30 or so similar times other words with the same meaning, such as "Don't be afraid," are used. She created the beautiful graphic above, including all 112 references she found. If you want to see the list of all the verses actually written out, you can check out her blog post here. Maybe, like me, you'd like to have a copy of Melinda's printable and work you way through the verses over the course of the next few months. Just click on her Etsy store link and get instructions for downloading it. While the idea of a "Fear Not!" for every day of the year is appealing, if we'd just take hold of one or two, or all 112 of these admonitions, and really hear what the Lord is saying to us, and obey him, it would change our lives! If it's a big fat slice of fresh, deeply satisfying, crunchy-crusted, flavorful, right-out-of-the oven sourdough bread you're craving, you should stop by our house about 10:00 on a Friday evening as Tom is pulling a loaf out of the oven. It's a scene that has been repeated nearly every weekend the past several months as he has been preparing to publish his new Kindle book, Getting Started with Sourdough: Creative Bread Making. My man Tom is a Renaissance Man. His interests are varied and far-flung, and over the years he has had several. This is the boy who created his own recipe for soda crackers, and the college student who made a hot air balloon from a cleaners bag and watched it soar from SPU, past the Ballard Bridge, and then out of sight. Before we met he had a loft of racing pigeons and many weekends during the year he could be found at his pigeon club or racing his birds from as far away as San Francisco. He brought to the marriage a mini-library of books about homesteading -- pole barns, cheese making, raising goats, baking bread -- and a number of fine cookbooks. He also had a flour mill for grinding his own flours. My girlfriends were astonished to learn that I had given him a lovely soup stock pot for our first Christmas together, and that he was tickled pink with it! He's also a "process" kind of guy. When pursuing an interest such as fly fishing, violin making, or photography Tom spends hours reading whatever he can get his hands on, watching videos, and thumbing through related catalogs and website. That's what he did with his sourdough passion. He even attended a weekend artisan bread baking class last spring, taught by Pat Hains at Hains House, her B&B near Olympia, where she offers a weekend class each month. He took the various approaches to sourdough that he studied, each technique and speciality that he explored, and synthesized it all into a simple approach to making a wonderful loaf of bread. As the book description on Amazon says, "you can nurture both sides of your brain with this guide to making sourdough bread. The left side of your brain will appreciate the step-by-step process and the precision called for while the right side of your brain will be set free to create exciting loaves by adding herbs, spices, flours, even leftovers. Whether you are a beginning baker of sourdough bread or just looking for some tips to improve the bread you already make, this book will give you confidence on your way to your perfect loaf of sourdough bread." 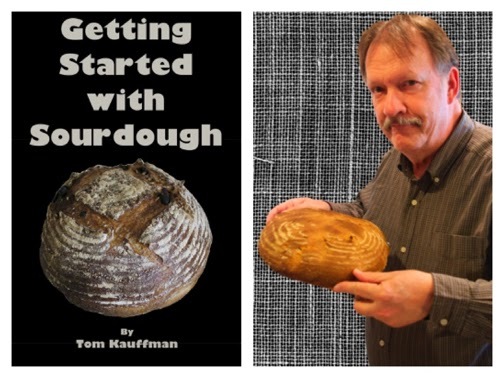 Tom has done a good job on Getting Started with Sourdough and I invite you to check it out on Amazon. Don't just look at it, though. Purchase it for yourself and tell your friends about it! Oh, and please don't knock on our door at 10:00 on Friday night for a piece of Tom's fresh bread. I'm sure you'd much rather be in your own house, enjoying a slice of your own sourdough, just out of your own oven!